Before starting your registration process, please review the warnings and tips as well as the instructions further below on this page, including the league age division chart near the bottom of the page. Note that fees have increased this year due to rising costs to meet additional demands. Full fee information is included on the Spring Season page describing our spring program. Pre-Season Training, for our Minor through to Senior Division players and coaches. This is a trial for this year only, with limited availability so sign up early, $100 for 6 two hour sessions at the Russell Sports Dome. Minor/Major 8:00 to 10:00 am on Saturdays (March 23rd to April 27th) and Junior/Senior 8:00 to 10:90 am on Sundays March 24th and 31st, then 5:00 to 7:00 pm from April 7th to to April 28th. Currently sold out - we are collecting wait listed registrations in case we are able to expand with additional spaces in each session. If interested please register and add your player to the waitlist - more details on the Pre-SeasonTraining page. Spring Season Tee Ball to Senior Divisions (4 year olds through to 16 year olds). See our Divisons page for a description of each Divison and our Spring Season page for more details on the coming season, including information on fees. Coach / Volunteer Registration for the Spring Season TBall to Senior. Our league depends upon those individuals that volunteer their time to support our youth baseball program - we always have openings for those that want to help. See our Volunteering page for more details. Challenger Division Registration for both Players and Coaches/Volunteers for the Challenger Division. The Challenger program provides an opportunity for children with cognitive or physical disabilities to enjoy the full benefits of participation in baseball at a level structured to their abilities. For more information see our Challenger page. CRLL Aces 19U - Greater Ottawa Baseball League Registration for both Players and Coaches/Volunteers for participation in the GOBL for our 17 through 19 year olds. For more information please see our 19U page. 2019 Umpire Registration for returning and new umpires for the 2019 season. In addition to those adults/parents that wish to join the Umpire cadre, we accept registrations for those youth interested in becoming an umpire, league age 13 and above. See our Umpire Overview page for more information. Warning - Do not use any special characters including accents or hyphens when entering data on the final payment screen/step, it will cause an error that will not allow the payment to be processed. Tip: Be sure to confirm your player's proper league age and division of play prior to registering, all players must register in thier proprer division - movement to higher or lower divisions is by request to the executive board through the local association president. Tip: Be sure to have your player's "Health Card" and your credit card at hand. 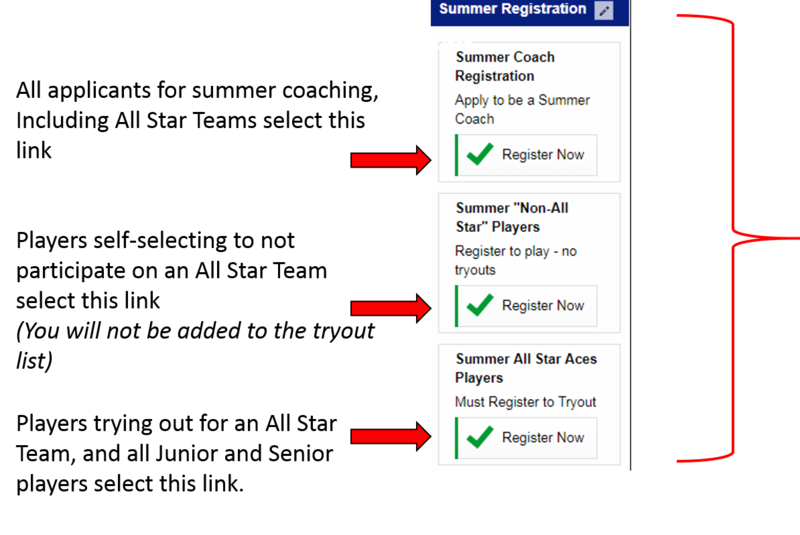 Tip: When selecting the Register Now button, be sure you are selecting the correct registration type, we are concurrently registering for Spring Season TBall to Senior, 19U Baseball, and our Challenger Division as well as Umpires and Pre-Season Training. Most players will be registering for "2019 Spring Season Player TBall to Senior"
Note: References are required, new coaches need to provide two references, returning coaches may provide the name of thier local association president as their sole reference. After clicking the Register Now button to the right, a login screen will open, if you have a current account then simply login with your email and password (if you have forgotten your password there is a link for that). If you are a new member then select the "New Here / Creat an Account" link. After creating your account the registration process will continue. Members may login anytime by selecting the "Member Login" button on the top right of every crll.ca web page. From the :My Member Account" select the "Register Now" button for a list of current open registrations. After you create your new member account, you'll need to fill out the parent/guardian form with your family information. (For coach / volunteer registration simply fill out your personal data as per the form) - Note if you are already a Member and are starting from the "My Member Account" page, select the "Register Now" button to see a list of currently open registrations, reselect the appropriate registration and continue by filling in the Parent Information as per above. ** Do not use special characters (accents, hyphen etc.) as it will corrupt the payment process!! Prior to proceeding with your player registration, please ensure you have verified your player's league age and division, using the chart below, in order for you to select the correct registration category. 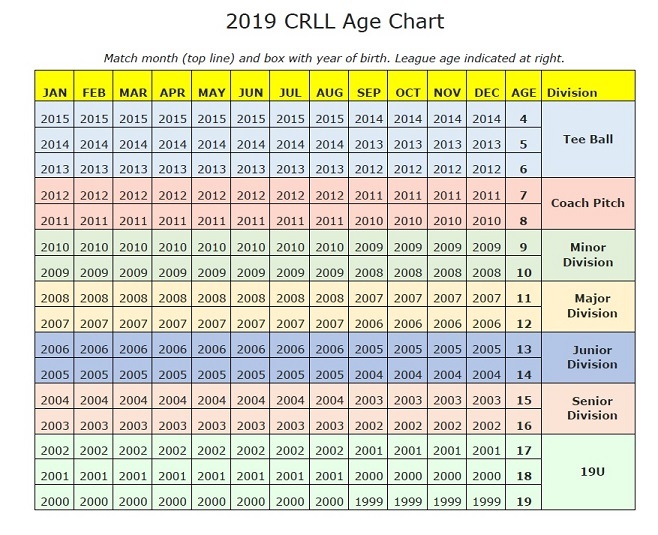 Enter the table at the top for your player's birth month and follow down the column to the player's birth year - scan across to the Age and Division columns to read your player's league age and appropriate playing division within Little League. Age restrictions are built into the registration process - you must register your player in the correct division for thier age - there is a space available to make special requests to your local association president should there be any issues. ** Note that registration for the 2019 Spring House League play is by Association for all divisions (Challenger and 19U are seperate registration categories). Please be sure to select the appropriate Summer Registration Link. Information on CRLL's Summer Program is available on our Summer Season Program page. All Star Tryout information will be posted on our Aces All-Star Tryouts page when available.